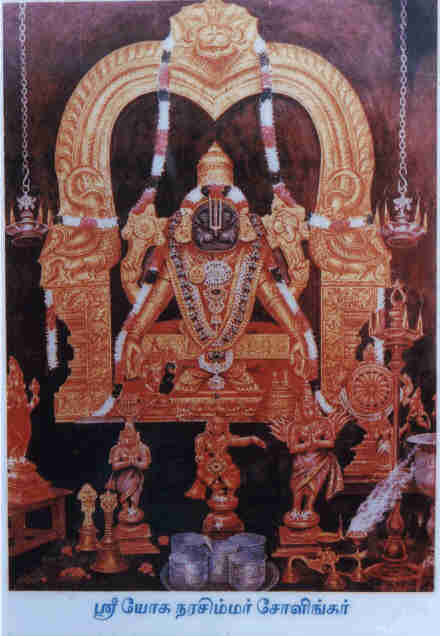 Lord Vishnu who undertook the Narasimha Avataram at Ahobilam (Andhra Pradesh), once again displayed the Narasimha Avataram to saptha rishis, who undertook penance at Sholingur. Hence, this is said to be the one of the most sacred of “Divya Desams on the Hill” in Tamil Nadu. Located about 90kms west of Chennai (and about 25kms from Arakkonam and 40kms from Tiruttani), atop a hill on a single stone is the Lord Narasimha Divya Desam in Sholingur, also called Chozha-Simha-Puram and Thiru Kadigai. This is also referred to as UtheeCheerangam (North Srirangam). There are two temples of significance here- the Yoga Narasimha temple at Periya Malai (the big hill) and the Yoga Chathurbhuja Anjaneyar temple at Chinna Malai (the small hill). Like Tirupati, this is also on top of a hill. It is located at an altitude of 750 feet. And, one has to climb 1305 steep steps to reach the temple. After 800-odd steps, there are a few rather steep curves. Once we negotiate these, there we come to final 100-odd steep and straight steps, leading into the temple. One has to walk the steps to arrive at this temple. There is no other transportation mode to reach this hill temple. You have to really sweat it out physically to have an audience with this Lord! Many attempts by well meaning people to provide a bus route and other means of transport have come to a naught. Devotees, young and old alike, make a slow step-by-step climb to savor the ultimate pleasure of having the glimpse of Lord Yoga Narasimha, seated ever so comfortably in a yogic posture. 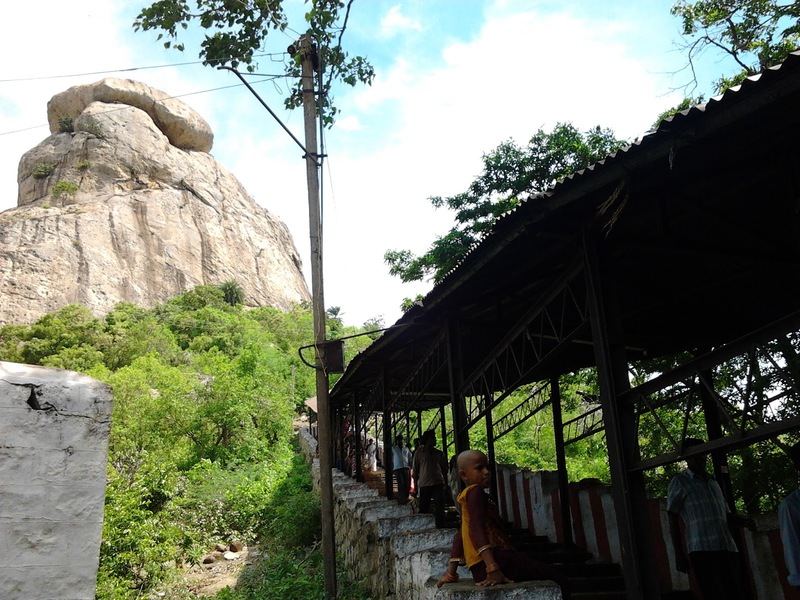 East of this Sannidhi in another hill is the Yoga Anjaneya Sannidhi (one has to climb another about 406 steps to reach the Sannidhi atop the chinna malai). Sage Vishwamitra, who undertook penance here, was blessed with ‘Brahmma Rishi’ by Lord Narasimha, within 24 minutes (One Kadigai/ One ‘Naazhigai’). Following the foot steps of the great sage, Saptha Rishis too undertook penance here at Sholingur wanting a darshan of the Narasimha Avataaram and hoping to get the darshan within 24 minutes!! Hence, it is believed that one who stays here for 24 minutes will attain Moksham. During his rule, the great Chozha king, Karikaala Chozhan, called this region Thiru Kadigai. Kadikachalam is the name of this temple. Kadigai means 24 minutes. Lord Narasimha, it was said, had granted seven rishis moksha (liberation from this world), when they meditated for a Kadigai. Narasimha is the fourth incarnation of Lord Vishnu in the Dasavathara. Lord Narasimha, after slaying the demon, Hiranyakashipu, in the Narasimha avatar reached this hill to bless the saptha rishis, who were doing penance at the Kadikachalam hill. The sapta (seven) rishis are: Vasistha, Kasyapa, Athiri, Jamadagni, Gautama,Bharathwaja and Viswamitra. They did penance at this hill for a Kadigai (24 minutes), prostrating before Lord Narasimha. Lord Narasimha protected his devotee Prahalada after slaying demon Hiranyakashipu and reached here straight from Ahobilam (in Andhra Pradesh) and granted moksha to these Maharishis. Hence this place came to be called as Kadikachalam. Those who worship this Lord for a Kadigai, they will be blessed by this God. It is also believed that Sage Viswamithra meditated here for a Kadigai and obtained the Brahma Rishi title. Kadikachala Kshetra Mahatmiyam is described in Brahma Kaivartha Purana. 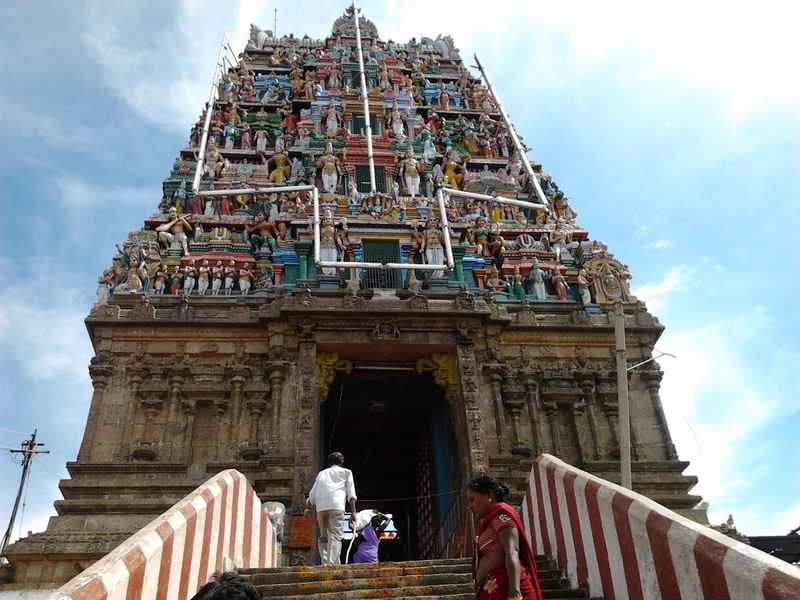 This temple is also among the 108 Divya Desams (Vishnu shrines). 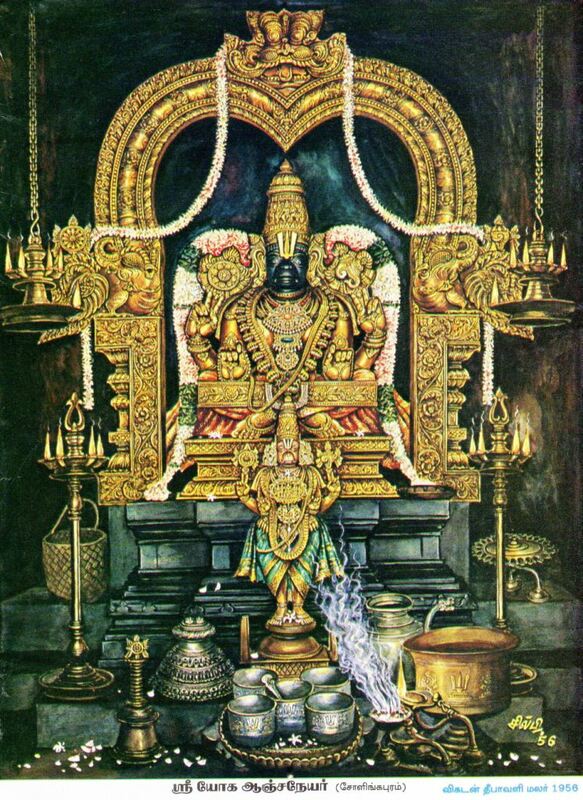 Tirumangai Azhwar has called Lord Narasimha as Akkarakani (nectar).The Vimanam or the temple tower is known as Hemakoti Vimanam. The Goddess (big) of this temple is known as Amirtha Valli Thayar. She blesses the devotees with boons (yielding, prosperity, longevity and happiness). 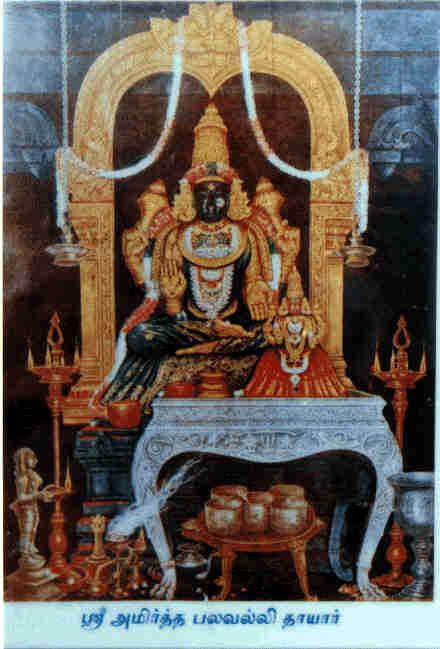 The utsava (small) Goddess is known as Sudhavalli thayar. 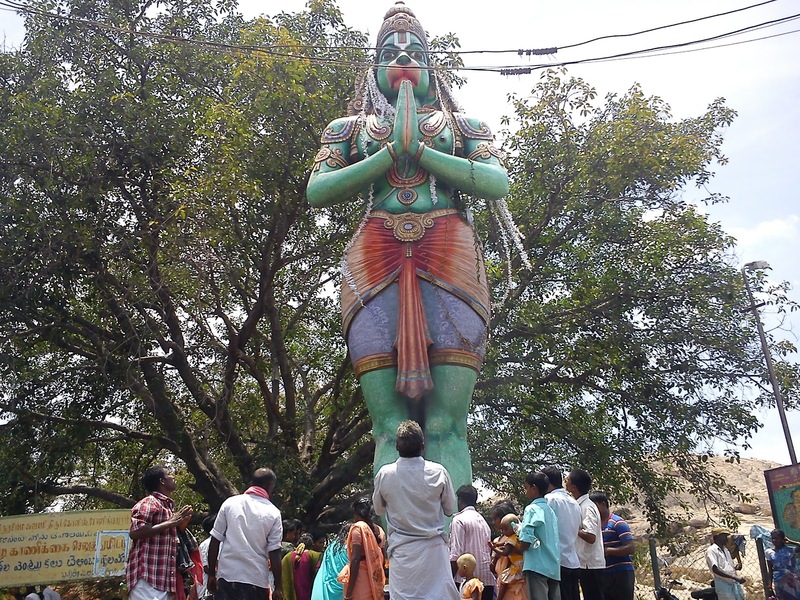 The unique feature of this temple is that Lord Yoga Narasimha (big deity) on the hill-top is seated in a yoga asana with Salagrama Hara (necklace) and Chaturbuja (four arms). HE holds Sanka (conch) and Chakra (discus) on two arms. The other two arms signify a meditative posture. Lord Narasimha, it is said, opens his eyes from HIS meditationonly during the Tamil month of Karthigai, which falls on November-December months, and blesses his devotees. Hence, HE has delegated HIS authority to Goddess Amirtha Valli Thayar, who grants instantly boons to the devotees who come to this temple. Stories are aplenty in this little hamlet on how devotees were cured of various diseases and other evil spirits. Goddess Amirtha Valli comes in the dream of devotees who stay here on vrath (seva) for a few days. Often, SHE cures their disease and fulfils their wishes. As we hear such incidents from a few devotees, we stand literally frozen. One has to see to believe. They have unquestionable faith in this Lord. Many visit this temple quite frequently with their family to show their gratitude to the Lord who has fulfilled their wishes. These hill temples are located at Kondapalyam, near Sholingur. Many frequently visit this temple and stay in choultries and other rooms available at the foothills. 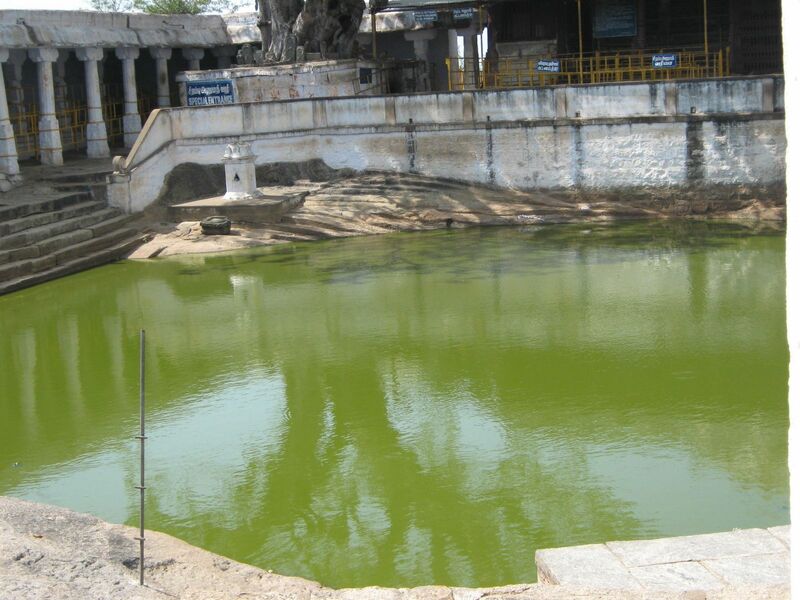 It is customary for the devotees to take a bath in the temple tank known as Takkan Kulam also known as Brahma Tirtham. It is round-shaped and a very big tank. People take a dip here before starting to climb the hills to have a darshan of the Lord. There is also a temple for Hanuman or Anjaneya in this place. It is also atop a hill. One has to climbaround 400 steps to have a darshan of Hanuman. Steps here are also equally steep. As we climb the big hill, it is really a tough experience. The overhead steel shade makes the climb somewhat less difficult. You can see many peddling eatables and water bags and making a living out of selling. You see monkeys freely moving around all the way, as though they are asserting their tenancy right. Unmindful of the heat, they roam around the steps looking to pounce on soft targets. Sure enough, they do mange to find their targets. Well, devotees appear unmindful of the aggressors and give up very easily. After all, these monkeys pounce on them to find their food. Many carry sticks to ward off the threat from monkeys! More often, the monkeys win over men! Since Lord Hanuman lives here, HIS family of monkeys also has its dwelling place in these temple hills. They are very tricky customers. From plucking the fruits to scaring away devotees and fighting with their colleagues they evoke a range of emotions (fear, excitement, anger and what not). They are quite efficient in plucking the flowers adorned by female devotees on their heads. Hence, many visitors dont keep flowers on their head. The monkeys, however, keep away when we say Rama to protect ourselves. Anjaneya (and HIS family) is the foremost disciple of Lord Rama. The Utsava (small) deity is known as Bhaktavatsalar. HE resides in the plain (not in the hills). There is a separate temple in Sholingur town for the small deity Bhaktavatsalar with Goddess Sridevi and Bhoodevi on either side. It is an old temple dating back to many years. This place was previously known as Chola Simha Puram. It later came to be known as Sholingapuram. This utsava deity is brought to the hilltop only a few days in a year - during Narasimha Jayanthi, the birth star of the Lord Narasimha; when hoisting the flag or the Dwajaarohana (Chitirai Utsavam) during Brahmotsavam (performed for ten days) every year; and during the Kalyana (Vivaha Mahotsavam) in March known as Panguni Uthiram. The divine marriage of Goddess Sudhavalli Thayar with Bhaktochitar is performed in the hilltop. The Lord is also brought back during the Dwajaavarohana or while bringing the flag down on the ninth day, a day before the finish of the Brahmotsavam festival. There is also a sannadhi for Adi Keshava in the Sholingur town temple. Interestingly enough, Sholingur has one more temple at the foothills near the Takkan kulam. 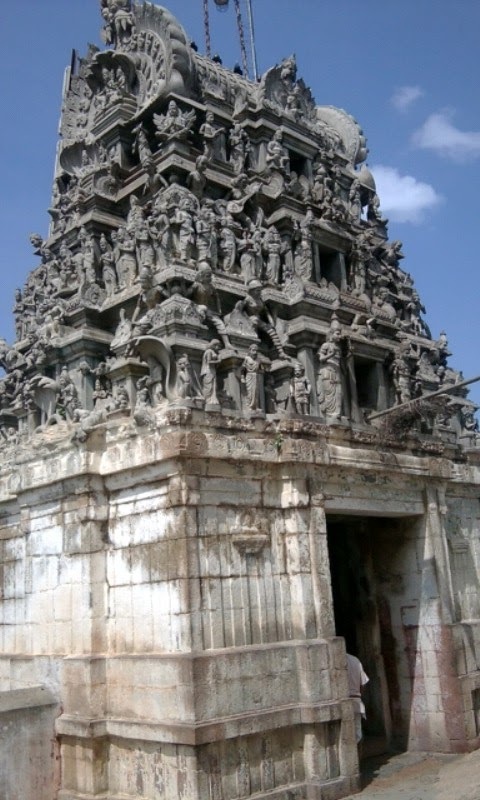 This temple is a link between Kanchipuram Varadaraja and a Swamy known as Dottacharya. Swamy Dottacharya had done essential service to the Lord at the Sholingur hills. Dottacharya Swami used to visit Kanchipuram Varadaraja Swamy every year. He was unable to do so once because of ill health. He felt very sad and recited five slokams composed on Lord Varadaraja. At that point of time, the Brahmotsavam festival was going on at Kanchipuram. Lord Varadaraja was seated on Garuda Vahana.While Swamy Dottacharya chanted the slokams, Lord Varadaraja disappeared from the Garuda Vahana at Kanchipuram even as the Pujaris stood stumped. Lord Varadaraja appeared on the banks of Takkan Kulam (temple tank) in front of Dottacharya Swami. Hence, a temple was built here. This event dates back to nearly 400 years. After giving darshan to Dottacharya Swami, Lord Varadaraja re-appeared at Kanchipuram and the Pujaris were overjoyed. It shows the benevolence of the Lord towards his devotees. Utsava deity Bhaktavatsalar comes in a Girivalam once every year at Sholingur. This takes place on the third day after Pongal in the month of Thai (January). Many devotees - young and old - go in girivalam at this time. It is indeed an exhilarating experience as it continues into night and ends the next morning. The Lord visits each and every small hamlet located around the hills. The devotees welcome the Lord with fruits, flowers, coconuts and garlands during the occasion. All along, one could see a festive atmosphere. While Lord Bhaktavatsalar travels these places, devotees follow HIM during the girivalam overnight and reach the temple at Sholingur town the next morning. Sholingur town is located in the Vellore district of Tamil Nadu. Vellore is the district headquarters and is about 43 kms away from Sholingur. The nearest metro is Chennai, about 120 km south-east. A famous pilgrimage centre in the vicinity of Sholingur is Thiruttani, 25 kms away. ( Home to Lord Murgua, who is again seated on a hilltop). Very informative...May Lord LakshmiNarasimha Swami bless you for sharing the info. Very informative...thanks and May Lord LakshmiNarasimha bless you for sharing valuable info.